As unrest continues across several Middle Eastern countries, analysts are scrambling to explain the “arc of revolution.” Richard Cincotta’s recent post on the “Jasmine Revolution” predicts a relatively high chance of Tunisia attaining liberal democracy, based on demographic factors and long-term trends, and it’s drawn some well-thought out and provocative feedback from fellow demographers Elizabeth Leahy Madsen, Jack Goldstone, and Jennifer Sciubba. I have two questions. First, have you shifted to a new definition of age structures (intermediate, etc.) based on median population age? In the past, you and other demographic security researchers have measured age structure as the relative proportion of different age groups within the population, either the total population, total adult population, or working-age population. Why did you select median population age for this analysis? A quick review of the figures available on the UN Population Division’s website shows that the relative size of the 15-24 age group within Tunisia’s total population has been vacillating within the range of 19-21 percent since 1975. In 2005, that “youth bulge” was 21 percent, the highest since 1980, but there has been a rapid decline to 19 percent by 2010. As you say, no matter how age structure is measured, Tunisia is much further through the demographic transition than other countries in the Arab world. I would like to see this highlighted more in media coverage of the revolution, particularly in accounts of similar attempts to provoke uprisings that have taken place in Algeria, Egypt, and Yemen in recent weeks. From a demographic perspective, those attempts are less likely to achieve success (except possibly in Algeria, based on your map). My second question is for further elaboration on the steps that lead from a dissipating youth bulge to a greater likelihood of attaining democracy (leaving aside the also-difficult question of sustainability). If I understand your description of the mechanisms at work, in an authoritarian regime with a youth bulge, the government is able to keep its hold on power because the presence of a youth bulge either creates volatility or the threat of volatility in the eyes of the commercial elites whose support is critical to the regime. Does this support exist even in situations where volatility is rare, in which case the large youthful population is manipulated or whitewashed by the regime as a threat to stability? Then, as the age structure matures and becomes less youthful, the regime can no longer invoke youth (directly or indirectly) as a danger, and therefore support for the regime from the elites erodes? You don’t specifically mention economic conditions in Tunisia, apart from Ben Ali’s resource hoarding, but issues such as unemployment rates have been frequently highlighted in media accounts of the revolution. In addition to the unpredictable triggers such as the self-immolation in Tunisia’s case, do deeper-seated structural problems such as high unemployment and/or rampant corruption have to be extant to provoke revolution in an authoritarian context? Or is the dissolution of a youthful age structure combined with an unpredictable trigger sufficient? 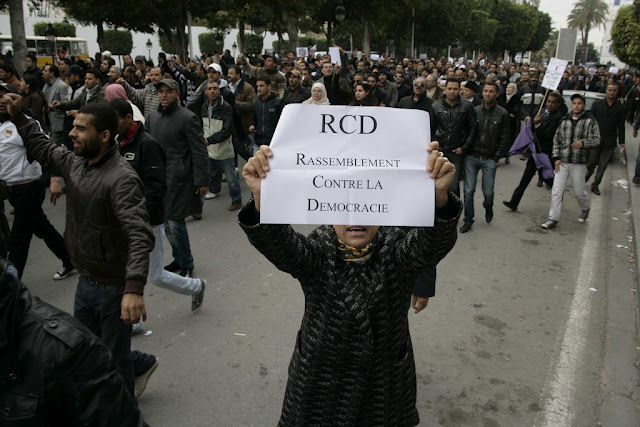 Richard’s insights into Tunisia’s prospects for democracy are terrific and I agree with him. However, in regard to the causes of the rebellion, I have to disagree with him in one respect – Tunisia in 2010 is very much a youth bulge country, at least as far as political theory would see it. As Henrik Urdal has shown, youth bulge should not be measured as the size of the youth cohort (15-24) against the entire population, but as the fraction of youth in the adult population (those aged 15 and older). The 0-14 group is politically not relevant, and should not be counted in assessing the impact of youth cohorts on the total population’s political mobilization potential. For Tunisia, median age may in fact be misleading (as I didn’t realize until I looked at the age pyramids that Richard has posted). Because birth rates fell very rapidly after 1995, median age in 2010 is intermediate, but if you look only at the population aged 15 and up, you still see very large cohorts of youth compared to total adults. Because Tunisia’s birth rate only started falling sharply after 1995, the large cohorts born in 1986-1995 – now age 15-24 – still make up a very large portion (33 percent) of all adults. While the next cohorts are much smaller, meaning this youth bulge will soon fade, it is still very much present, as Richard’s graphs show. There is no automatic link between a certain age structure and political rebellion, but the combination of a large youth bulge and economic frustration among youth is a potent force for political instability. That combination is certainly one feature of Tunisia in 2010, although the extreme corruption of the Ben Ali regime and his family was a galling and critical factor in the widespread rejection of his regime. That points to another bit of misleading data. Many (including me) assumed that because Tunisia’s recent economic growth was strong, at five percent per year, economic grievances could not be so widespread. But that is wrong, because we did not appreciate how much of that growth has been grabbed by Ben Ali’s family (which according to one account had ownership interests in half the businesses in the country) and cronies. Substantial growth from which many have been excluded – especially youth – is in fact a reason for widespread grievances, and that was another key factor behind the mass protests. Like Jack and Liz note, using median age helps us understand Tunisia’s progress along the demographic transition, but it doesn’t really help us understand the protests in Tunisia or in other countries across the “arc of revolution.” Median age obscures the individual experiences of young adults who are putting their lives at risk to speak out in protest or setting themselves on fire in desperation. As Jack points out, from a theoretical point of view, Tunisia is very much experiencing cohort crowding – whether we call it “youth bulge” or “early worker bulge” the outcome is the same. To say that Tunisia is not a youth bulge country misses the point. Part of the reason we political demographers buy into the link between youth bulge and conflict is the idea of cohort crowding. As Richard Easterlin points out, a cohort’s economic and social prospects tend to have an inverse relationship to the cohort’s size relative to those around it, other things being constant. In Tunisia’s case, those between ages 25-35 are part of a larger cohort than those preceding ones so they are crowded out of the labor market and will tend to have lower relative income compared to preceding generations, which are smaller. That quotation seems eerily prescient in Tunisia’s case. Mohamed Bouazizi certainly seemed to succumb to fatalism, and the protests started as economic but quickly moved to political. Political, social, and economic marginalization are connected. While there is some diversity in age structure across the Middle East, the populations of those aged 15-24 in Egypt, Lebanon, Tunisia, Jordan, Algeria and Iran, which experienced youth protests in 2009, are all between 27 and 34 percent of all adults ages 15-59, with Lebanon and Tunisia at the lower end of the spectrum and Egypt and Jordan at the higher. As we can see from the population pyramid of each of these states, there is a clear population bulge at these ages. We also have to think about the cohort effect. The cohort effect describes shared historical experiences of particular age groups. Across the “arc of revolution,” young adults are plugged into Facebook, Twitter, and other internet forums to share experiences of marginalization and revolution. This likely informs their choice of whether or not to speak out. Cincotta has promised a reply to the comments is forthcoming, which we can forgive him, frankly, given the length and complexity of these great responses. Sources: Huffington Post, Middle East Youth Initiative, The New York Times, Telegraph. Photo Credit: “055,” courtesy of flickr user Nasser Nouri. Jack Goldstone offered a little more clarification on his comments, on Rich Cincotta's original post: https://www.newsecuritybeat.org/2011/01/tunisias-shot-at-democracy-what.html?showComment=1296767536671#c8199887821321455149.